Straight Forecast: Picking the first two finishers of race in the exact order. Quinella: Picking two horses to finish first and second regardless of the order. Tricast: Picking the first three finishers of race in the exact order. Superfecta: Picking the first four finishers of race in the exact order. 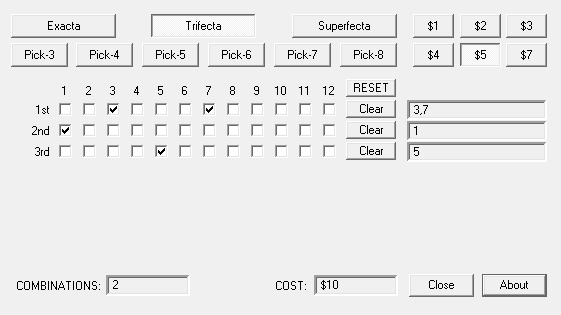 There are also 5 and 6 picks variations in the Superfecta exotic wager. Picks: Can be 3, 4, 5, or 6, pick 6 for example is picking out a given race’s exact finishing order of 6 horses. When placing wager on a daily double, or a simple each-way bet there is no real need for a horse betting calculator, but when things start to get complicated as in picking exact winning orders, or the winning horses of a given number of races, the need for a horse racing calculator rises to become a feature inseparable from exotic wagers. The horse racing calculator computes the total number of combinations and total cost of placing a wager. For each exotic wager, the use of a horse racing calculator is highly recommended. Different exotic wagers have different combination possibilities that significantly affect the stakes in cases of multiple combination and so the need for a horse racing calculator in order to keep track of the stakes and earnings is imminent. A horse racing calculator can reveal the potency of an exotic wager in terms of how many stakes were raised and does the earnings compensate on that. Many punters have moved on from regular win, place or show wager and are now already mastering several types of wager altogether. Since keeping track of all the figures of the wager, the stakes, the number of exotic wager, the number of possible combinations, and the possible returns of a wager, is a difficult task requiring time and patience, using a horse racing calculator is the way to prevent calculating mistakes and improve the wager process.